Cape Coast Castle is a European-built fortress situated on the central coastline of Ghana. Since its initial construction in 1652, the Castle served as a trading post for European nations and as the headquarters of British colonial administration for the Gold Coast Colony. Today the Castle is a designated UNESCO World Heritage Site. In 1652, the African, Asiatic, and American Company of Sweden employed Henrik Carlof, a Polish merchant, to negotiate a land agreement with the authorities of Efutu, the small African kingdom that controlled the Gold Coast. Successfully gaining permission to construct trading facilities along the coastline, the Swedes established Carlusborg Fort, named in honor of the Swedish king. The fort had high, thin, mud brick walls and became the structural base for the Cape Coast Castle. The Carlusborg Fort remained in Swedish hands until 1657, when the rival Danish West India Company usurped the establishment. Several more transfers of power occurred between the Danish, Dutch, and Swedes in the early 1660s. In 1664, however, a small English fleet seized the Castle (as it was later called) in a brief battle led by Captain Robert Holmes. 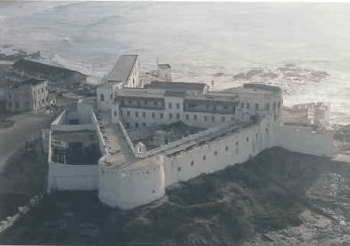 The British would remain in control of Cape Coast Castle until 1957. The Company of Merchants, whose governors administered the entire British colony, extensively rebuilt the Castle in 1699 and periodically throughout the 18th century. It was expanded landward and seaward, using both local and imported materials in its construction. In 1797, 50,000 bricks and 2,000 flat tiles were imported from England. The expansion of the Castle was necessitated by the growth of the slave trade, which, between 1700 and 1807, constituted 90% of business on the Gold Coast. Throughout the 18th century, the Castle served as a “grand emporium” of the British slave trade. Thousands of enslaved Africans, sometimes from hundreds of miles away, were brought to Cape Coast Castle to be sold to British slave ships. During the interim period, Africans were imprisoned in what the British called “slave holes,” or dungeons in the basement of the Castle that had little ventilation and no windows. When the British abolished the transatlantic slave trade in 1807, 90% of the British commerce on the Gold Coast was rendered illegal. Though some in Britain argued that the African settlements should be abandoned, an 1821 Act of Parliament transferred the management of the Castle from the Company of Merchants to the British Crown. The Castle served as the head of English administration of the Gold Coast until 1877, when the colonial government moved its headquarters to Christiansborg. Since then, the Cape Coast Castle has functioned as a provincial center, complete with a law court and a school. After Ghana (formerly the Gold Coast) gained independence in 1957 the Castle underwent an ambitious restoration project sponsored by the Ghana Museum and Monuments Board. Today the Castle is a museum that encourages tours of the old slave-holding dungeons. William St. Clair, The Door of No Return: The History of Cape Coast Castle and the Atlantic Slave Trade (New York: Blue Bridge, 2007); http://www.capecoastcastlemuseum.com/.